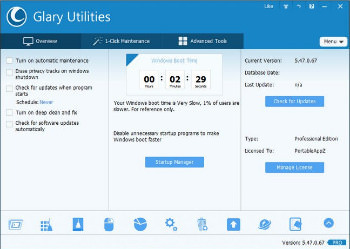 Glary Utilities portable is a collection of system tools and utilities to fix, speed up, maintain and protect your PC. It allows you to clean common system junk files, as well as invalid registry entries and Internet traces (theres a plug-in support for 45+ external programs). You can also manage and delete browser add-ons, analyze disk space usage and find duplicate files. Glary Utilities Pro offers numerous powerful and easy-to-use system tools and utilities to fix, speed up, maintain and protect your PC.